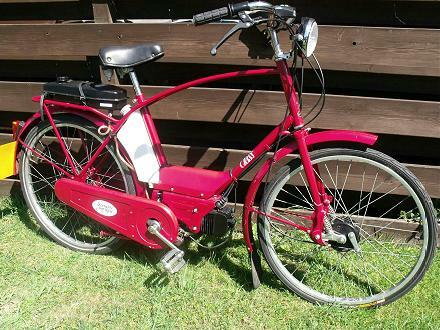 This was an interesting looking machine that caught our eye, because it carries the charming appeal of an old-fashioned cyclemotor, though it is actually a relatively modern version of a traditional pedal moped. Leopoldo Tartarini was born at Bologna on August 10th 1932, into a motor cycling family where his father operated a dealership selling Frera, Moto Guzzi, and various other brands, then later a Ducati agency as the company became established after World War 2. The young Leopoldo started competition in smaller capacity categories to obtain his international sport licence, and secured several racing successes for Ducati and Benelli, before an accident in the 1955 Motogiro left him badly injured and brought his racing career to a premature halt, but he still kept riding motor cycles. In September 1957 Leopoldo and fellow racer Giorgio Monetti embarked on a journey around the world using two Ducati 175cc motor cycles as a publicity stunt, covering 60,000km and visiting 42 countries on five continents. They left Bologna to ride to India, then Australia, New Zealand, South America, North Africa, and through Europe back to Italy. Upon their return in 1959, Leopoldo decided he was ready for a new challenge, so left the family dealership business to begin the establishment of his own motor cycle company at Castel San Pietro Terme, and produce motor cycles using MZ engines, which resulted in the original company name of Italemmezeta. The first bike was a 125cc two-stroke model, followed in 1962 by a sports moped then called the Italjet, which Tartarini soon renamed his company after, then went on to build further Minarelli powered models. Ongoing early 1960s’ Italjet minibikes included ‘swinging’ names like Kit-Kat and Go-Go, then the 1967 Italjet Grifon 650 with its Triumph Bonneville motor attracted the attention of American motor cycling entrepreneur Floyd Clymer. In the confusion following the Associated Motor Cycles business collapse of 1966, Indian branding was ‘unofficially adopted’ by Clymer, who ‘attached’ it to USA imported Italjet mini-bikes with 50cc Minarelli engines, and popularly sold these as new ‘Indian Papoose’ models, as well as returning more Indian-branded Royal Enfield and Velocette engined motor cycle models with Italjet designed and manufactured frames. Clymer’s death in 1970 brought an end to this Indian episode. 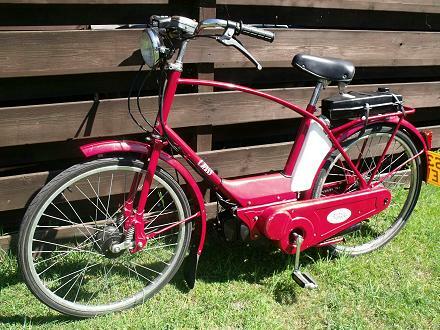 The ‘Ladies’ style Tiffany step-through frame version of our Class moped came to be distributed in the Netherlands through Yamaha’s network from 1990, seemingly as an attempt to capture ‘Snorfiets’ sales from the Spartamet–Sachs. The ‘Gents’ style crossbar-frame Class version didn’t appear to get any mention for the Dutch market, so it’s presumed the model might have been considered to hold minimal appeal to gentlemen there, who generally seem to favour geared machines. On some parts of the continent these machines were designed to be practical to use as either a pedal cycle or a moped. The idea behind this being that you could drive it on the road into town, then switch to pedal mode and cycle it along specific cycle paths and in other traffic-free areas. The Netherlands had ‘Snorfiets’ category machines, as a performance limited class of moped restricted to 25km/h (16mph), for which wearing a crash helmet is not a mandatory requirement, so the Tiffany would almost certainly have been restricted to comply with this specification, typically by fitment of a diminutive 8mm carburettor or other limiting means. Some early examples of Tiffany and Class machines found their way back across the channel as private imports from the continent, but may be variously restricted to comply with different market regulations, but they also came to be officially imported and listed in Britain. 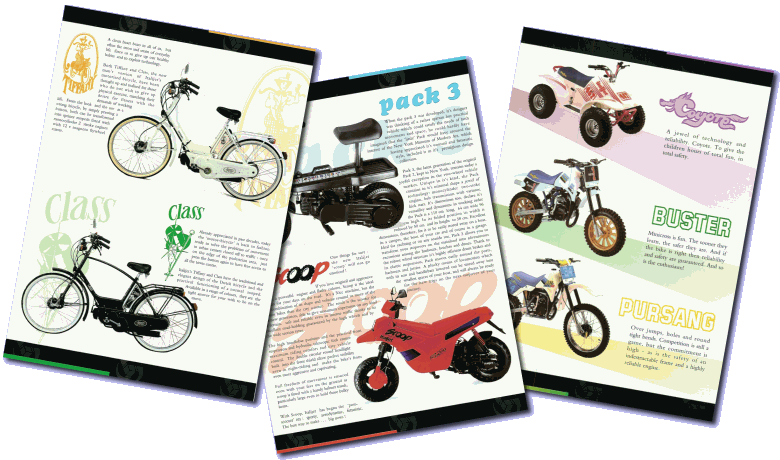 Class & Tiffany models were being advertised across Greece during 1993, and were listed by Italjet Moto (UK) Ltd by December 1993 as part of a range of machines at the time including the folding ‘Pack-3’ and other motor cycle models. Since the UK specification didn’t require market built limited performance as 25km/h ‘Snorfiets’, nor compliance to continental 40km/h moped regulations, maybe British market machines might have been ‘carbed up’ to the engine’s full potential? Coasting up and down the road as our pacer readies himself (our Class has no speedometer), the acceleration proves stronger than we expected, but the revs also seem to rise quickly, so we suspect these bikes were probably quite low geared, and consequently may not be expecting a great turn of speed. Our pacer turns in behind us so we throttle away smartly down the road and round the corner … the initial phase seems positively brisk, but there’s obviously a vibration issue going on here, and it just gets worse the faster you go. Cruising along with our pacer we determine that the vibrations start creeping in around 12mph, then you can run up to 15mph where they become more noticeable, and cruising up to 18mph they increase to becoming uncomfortable above that speed. Perhaps if we go faster, it might be possible to get through the vibration band? No you can’t! The vibes absolutely get a lot heavier the faster you go, and it gets so bad that the vibration proves more of a limiting factor than the bike’s actual performance. There have been times on a few road tests over the years where there have been moments when we wondered if we might survive, but never quite expected to be facing the prospect of death by vibration! 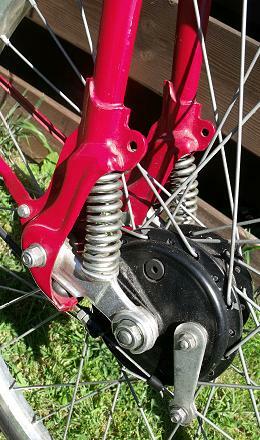 Some of the bike’s vibration problems are probably compounded by the obvious fact that the motor is under-geared, so it’s very capable of revving out, and under-geared machines are always worse for developing vibration than a motor that is constantly pulling a load—but what we have with the Class however, is vibration on a completely different scale of pain. It’s no wonder all the tanks split! Up to 18mph is a little uncomfortable, though survivable, but above 18mph you’re starting to play Russian Roulette. Will the fillings fall out of you teeth before your eyeballs blur into double vision? You might be sterilised? Will your blood boil with air bubbles and give you a brain haemorrhage? Braving all for the sake of completing our road test, we manage to push up to a paced 23mph flat out on the level, which suggests this bike was probably built to a continental 40km/h market specification. Though the bike relatively easily got up to this speed, there’s no way a rider would be able to hold at this pace for long—you just couldn’t endure the vibration … but there is more … would the downhill run be survivable, or might it be like the first pilot flying through the sound barrier, where everything goes smooth and quiet? With everything frantically buzzing like we couldn’t believe, we dive into the downhill section. Directly in proportion to the increasing revs, the vibrations continue to increase through shattering waves which course through the frame, the saddle is tingling so furiously we slide to the side of the seat to try and ease the pain. The handlebars are now vibrating; the howling scream of the engine and everything on the bike is trembling like a high frequency earthquake—then … Arghh! 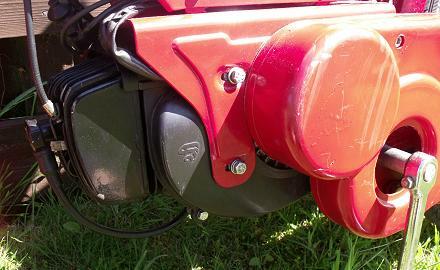 … the electric horn cover on the handlebars bursts open so the battery explodes out of the case and bounces down the road, leaving the lid flapping on its hinge. We shut down and abort the dive, while our pacer is frantically hauling on the brakes behind to avoid crashing into our back… and manages to run over the battery. Picking up the pieces, we decide we’re definitely not going to attempt that again, and the final paced downhill speed must sit at 29mph. The challenge of trying to break the 30mph barrier on an Italjet Class can go to some other rider on another day—that’s quite enough of that, thank you very much! After having been devastatingly shaken and disturbed by our Class’s motor, it’s almost a pleasure to switch the drive lever on the left side of the rear hub to ‘cycle mode’. This completely disengages all connection to the engine and allows the machine to be ridden like a normal bicycle without any of the energy sapping drag that often afflicts a lot of mopeds. The relative calm and tranquillity of cycling can however be returned to the chaos of vibrating madness at just the push of a button on the back of the transmission case, which releases the latch on the drive lever. The idea of pedal-cyclemotors no longer seemed to register with people in Britain by 1993. The pedal moped had long been phased out following the ‘slo’ped’ reclassification of 1976, so a traditional moped wasn’t something that people may generally relate to any more. The Class and Tiffany didn’t hold any particular advantage over any other type of 50cc machine, since a moped is now always a ‘slo’ped’ in the UK, and doesn’t become a bicycle just because you may not be using the engine, so technically, you still have to wear a crash helmet even if you’re pedalling it. The idea was possibly more suited to different legislation on some parts of the continent, but not anything that could quite work with UK motoring regulations, so examples of either type are only infrequently seen. With around 180 workers producing up to 90,000 units a year from Italjet’s modern 10,000m² factory on the Adriatic coast near Pescara, the business surfed the popularity of a European scooter boom through the 1990s, which fuelled a revival of the company’s competition aspirations for 125 GP racing in year 2000. This coincided with the time when the new Grifone motor cycle, powered by a 900cc Triumph triple engine and launched at the 1999 Milan Show, was being developed toward production, and a completely new factory in Roseto being built to manufacture this new model. A sudden collapse of sales in the European scooter market and financial over-commitments soon resulted in withdrawal from competition after the 2002 season, and sudden cancellation of the Grifone project but, by 2003, the receivers had moved in. The Pescara factory and the firm’s Bologna headquarters both closed, and the majority of its product lines were sold by the administrators to Kinetic in India, where various Italjet designs and models continue to resurface periodically. Italjet’s latest three-wheel ‘Scoop’ design, which had debuted at the 2001 Milan Show, was acquired by Piaggio then branded and re-launched to become the acclaimed twin front-wheel MP3 that is still on sale today. During its 44 years of existence, the original Italjet Company developed more than 150 motor cycle and scooter models, many of them original and imaginative designs, with most created by Tartarini himself. This wasn’t however the end of the road for Leopoldo, as he next founded the Tartajet design consultancy, focusing on the development of advanced concepts for various clients around the world, including major manufacturers in Europe and Asia. In 2005 a revived Italjet company was launched by Leopoldo’s son, Massimo, and under this new direction developed a range of lightweight touring motor cycles based around the South Korean Hyosung 650’s frame and engine. Leopoldo Tartarini passed away on 11 September 2015 at his home in the hills outside Bologna, at the age of 83 … a great loss to the motor cycling world. Next—As the relentless battle for urban survival continues, increasingly unlikely vehicles become requisitioned and pressed into service by the beleaguered forces for motor cycling justice, this is: Moped Army 2. This article appeared in the October 2017 Iceni CAM Magazine. Our 43rd edition worked out with each article being connected to another, which can only be appreciated in the printed magazine format, as these links will become lost as the separate features become transferred into the ‘articles’ section of the website. The Excelsior S1 Autobyks are obviously connected to the Corgi, but the ‘Touch of Class’ third feature also links Italjet back to the Corgi via Brockhouse, through a tenuous association to the Indian brand. This ‘associated articles’ linking wasn’t actually planned when the subjects were chosen for edition 43, it was just a chance that showed up in the research, so we slipped it in. The Italjet Class and Tiffany models were odd machines for their time, like some 1990’s throwback to a lost age of obsolete pedal mopeds. The ‘Touch of Class’ article very much brought home how the all-conquering pedal moped eventually became just as obsolete as its autocycle and cyclemotor predecessors. A change in the definition of UK mopeds in 1976 signalled demise for the combination of the pedal assisted motorised cycles in favour of 30mph restricted 50s with footrests so, by the time the Class and Tiffany moped models came to Britain in 1993, the whole concept had already been extinct for a generation! The Class was an eye-catching and interesting looking retro-style machine, but we found it just as difficult to start as the Dutch reports stated, and it’s easy to imagine how that might have been an issue with the continental ladies who bought Tiffany versions. 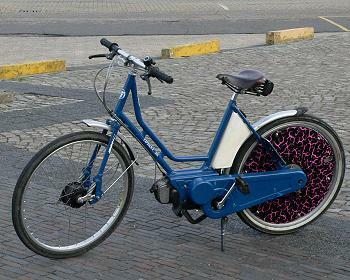 While some markets might have demanded more restricted performance (eg: Dutch ‘Snorfiets’ category machines limited to 25–30km/h / 16–18mph), we felt the bike we tested was most likely built to comply continental 40km/h moped specification (25mph). Due to their restricted performance, Snorfiets category machines probably wouldn’t have experienced the devastating vibrations that our example suffered at higher speeds, and maybe their original fuel tanks might have survived too? Our test bike was lent to us by EACC member Luke Booth from Hastings, and while it proved very capable at climbing hills, the Italjet cycle frame and Piaggio engine seemed a fractious marriage that was eventually going to shake itself to pieces. Research into the history of Italjet inevitably led back to its founder, Leopoldo Tartarini, who was a remarkable and imaginative motor cycling visionary and entrepreneur. Tartarini designed and produced a lot of machines in his very full lifetime, with far too much involved detail for us to be able to bear tribute to his extensive achievements within the limited space available of our minor feature on the Class moped.